With a chic and sophisticated aesthetic hearkening to the elegant garden furniture from days of yore, this table and chair set will make outdoor entertainment a stylish affair. Sturdy cast aluminum finished in a gorgeous bronze delivers timeless beauty and durability, holding up to weather fabulously. Supportive and comfortable mesh chairs will have you and your guests sitting to survey the view and enjoy one another's company for years to come. The chairs are very comfortable without cushions and the table is sturdy. The chairs move a move a bit when heavier 200 lb + people are sitting in them, but it's not a deal breaker. If you prefer to lean back in chairs, know that the chairs backs do recline quite a lot. It was quick and easy to put together by myself with a ratchet/socket set that I own--the "wrench" tool provided is useless. A couple things that could be better: 1.) The finish is a very shiny gloss--not what I was expecting or wanting, although I suppose a few seasons will take care of that. Still, unfortunate that it was finished this way. 2.) The table is too tall for the chairs. I'm 5"6" and while I can easily cross my legs while seated at the table, eating would prove difficult as the table comes up mid-chest (too high). Even when sitting on the edge of the chair it feels like I need a booster seat! My 6'1" husband also thinks it's too high. (I plan to shave an inch or two off the table legs with a saw made to cut metal.) As a sidenote, the chairs are also a bit high. This probably isn't the set for anyone 5'4" and under ... my feet touch the ground, but just barely. I was looking for a sturdy aluminum set that would be comfortable without cushions and this set meets those requirements. Overall, its an excellent value. I purchased this because I don't trust the durability of wicker and wanted something that could survive the mountain winters. This set is absolutely beautiful, (relatively) easy to put together, and is solid. I expect to have it for a very long time. It arrived well packaged and in perfect condition. There is also a little bottle of touch-up paint that came in the table box (nice touch!). The chairs are surprisingly comfortable for all metal. You sink into them just right. Great purchase! This dining set exceeded my expectations! The price was less than others I looked at and I was concerned that there would be issues with the quality. There are none! It's substantial without being too heavy. Came well packed. The chair design is lovely and not too busy, roomy and VERY comfortable with slightly leaning backs. Arm rests are wide enough and comfortably curved. The bottom of the seats are 19"x19" square if you need to get cushions. The table is 48" wide where some said 45". As others mentioned the small wrench was difficult to use and one we had made it easier. One of the 8 holes on the underside of the table did not line up with it's companion hole on the top of the leg to affix one bolt but it didn't seem to cause any instability and wasn't worth trying to return the table. The finish is very shiny but getting used to it and most wrought iron finishes soften a bit with time. I highly recommend the set! Decided on this set after several hours of research. We wanted to be able to seat 6 and this size table allows us to add a couple of chairs. The price was half of an oblong table with 6 chairs. Easy to put together except one screw got stripped (we glued it). The quality seems good. Everything sits nicely on the travertine patio without wobbling. The chairs are comfortable without cushions but I bought some thin ones with backs and ties to bring me up to the correct height for the table (I'm 5' 3"). This table was a couple of inches taller than our old one. The set is attractive and hopefully, will weather sitting out on an uncovered patio all year. The reviews seemed to indicate it would. Thank you, fellow reviewers! I love the set ,, However every right side chair is short half inch and does not sit flush unless someone it sitting in the chairs.. Beautiful color and beautiful product. Arrived quickly and was packaged great. This set is perfect! I was a little apprehensive ordering it sight unseen, but we have other Christopher Knight pieces and they are all excellent. This set, is high quality, good color and heavy enough not to be blown away by the wind. The seats are wide and comfortable. They could accommodate cushions but we don't use them. Highly recommend this item. Plus, it's a great value for cast aluminum. Nice wide seats, won't rust-aluminum, nice bronze color. To all potential buyers. Take it from someone that just purchased this item. Under no circumstances should you buy this five piece patio set. It is a pile of junk. Poorly manufactured and not what it is cracked up to be. To begin with this set is almost impossible to put together. The holes don't line up correctly and when you tighten the bolts the they will strip out. I am no novice at assembling products. I have put together gas grills and all types of furniture and cabinets etc. This product was a nightmare. After finally getting it assembled with some bolts and nuts that I purchased the table is very poor quality and the chairs are a joke. To begin with the table is not sturdy at all and only weighs about 40 pounds. The chairs are very small and uncomfortable. I consider myself to be of average height and weight. I am 6 foot tall and weigh 180 lbs and I could not fit in the chair comfortably. we purchased cushions for the chairs but they would not fit because the chairs were so small. Thankfully we purchased the cushions at Lowe's and it was no problem to return them to our local Lowe's and get a refund. This was my first experience wit Overstock and probably my last. This table and chairs are supposed to be a gorgeous bronze bu the whole set is as black as black can be. No bronze color at all! Live and learn! $*** gone in a puff of smoke.I am going to contact overstock.com to see if I can get some resolution on this matter but I have been told that this would be a waste of time. In the mean time do not purchase this product. It is a complete waste of money. I purchased this set after using a set that lasted 27 years. I love the look of this set especially with my full seat cushions. It is sturdy, easy to assemble and looked expensive compared to other sets I looked at in this price range. I called and was told the chairs were stackable, but I think that was in error. I still do not regret the purchased, it came quickly and updgraded my phoenix patio ambiance. Really enjoying this set. Easy to assemble, nice wide chairs and hole for umbrella. Great dining set at a great value! This dining set exceeded my expectations. It is a great value, sturdy construction, and the chairs have a larger, more comfortable seat than I was expecting. It was also simple to put together. Bought this to match the large rectangular set outdoor dining set, since we loved it so much and we want furniture that all matches and will last forever. Received the set in good condition, fairly easy to assemble. Table and chairs are all very sturdy...reminds us of bistro dining in Paris! A good purchase. The instructions say to protect from the elements, but it is an outdoor set. Hopefully it will hold up. Stay tuned for the word on that. This purchase was to replace my old patio furniture set. I am so happy with this purchase. It is beautiful. It was very easy to put together. My daughter and I took about 20 minutes to get the job done. All the hardware was included for the job so I did not have to dig in my husband's toolbox to find anything. 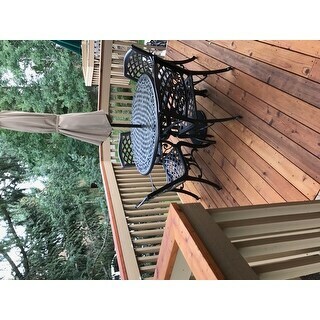 The design in the chairs is quite nice and what I really liked was is that the chair and table has levelers to adjust so that the chair does not shake. I am happy with this purchase. I was very impressed with how well everything was packed to keep it from getting scratched. It was also very easy to open and remove the items from the boxes. The color was a dark bronze that looked black in the shade. I was able to put the chairs together by myself although this isn't anything I usually do but was very anxious to see what it all looked like. I did need help with the table as it was large and somewhat heavy which is what I wanted. I looked at numerous sets before ordering this one and am pleased that I finally chose this one to order. Hoping it holds up for numerous years. I bought this item for my beach rental house. They delivered this time on time and was easy to put them together. So far, it is perfect for my beach house since I needed outdoor set that doesn't rust easily. Love this set! We own three of the chair/table combo's, but I wanted an actual table with chairs to go with the others. Bought this and handed it to my 13 year old. He put the entire thing together by himself in less than an hour. Easy Peasy! Just wished I had bought it three years ago instead of waiting. I am very happy with this patio set. Only 4 stars due to a couple of problems. There was some paint damage on a few of the chairs. I have asked for some touch up paint and hope they will send it to me. There are a few sharp edges on the back of the chairs and I did cut myself...but will sand them down. One of the screws on the table did not line up exactly, but I made it work. I'm 60 + woman and I was able to assemble it by myself. Not easy, but doable. There are good instructions, but you must follow them. I used my own socket wrench for final tightening of screws. I also read the reviews of others for good hints on assembly. Very happy I bought this set. Looks great on my deck. Beautiful, very heavy and sturdy tables and chairs. Matches existing furniture of same brand. Couldn’t be happier with this purchase. Assembly very straight forward. Looks nice however I am not sure how durable the finish will be long term, there were a few spots on the chairs that arrived shipped. Not worth my time sending them back but it did slightly disappoint me. Overall I would say this set is good for the price but then again only time will tell. Not crazy about the finish. Otherwise seems like a nice set. "What is the size of the umbrella slot?" The umbrella slot is 2.36 inches. "Are these chairs large enough to be able to add a cushion? They would get too hot as-is without cushions"
Yes, you can add cushions if you wish. "What is the weight limit on the chairs?" I believe it’s 250 lbs. We don't have a set weight capacity. However, we don't recommend anything heavier than 250 lbs. Love these chairs. Agree with the 250lb weight limit. They are not extra wide so a very large person would not likely fit in them. "I'd like to buy two additional chairs. Can chairs be sold separately? If so, how much each?" The chairs are sold in sets of two under item # 16045028. I hope it helps. "are there sister Items like a bench and side table that match this set?" Unfortunately, there isn't a sister set. "Does the table come with a glass top? Mary 12. May 10, 2018"
No it does not. Great table though. "What are the table dimensions?" Table dimensions are: 29.92 inches high x 47.64 inches wide x 47.64 inches deep.